Earn a BA and a full MDiv up to 2 years faster with the Accelerated BA+MDiv. If God is calling you to pastoral ministry--and if you are planning to earn an undergraduate and graduate degree, this program may be for you. With our new Accelerated BA+MDiv, qualified students can earn both their bachelor of arts degree and master of divinity degree in just five years. That's up to two years shorter than doing them separately. The program is designed for 18-21 year-olds entering undergraduate studies who have experienced a call to pastoral ministry and plan to serve churches in the United States. Students will be mentored by a dedicated program coordinator and students will have the opportunity to participate in hands-on ministry experiences. The ideal candidate for this program must be willing to devote themselves to full-time theological studies. 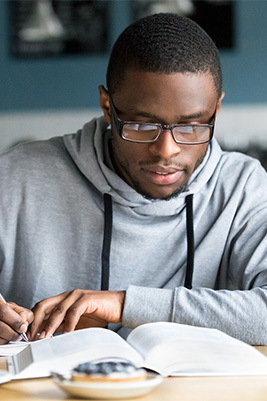 Students seeking admission into the Accelerated BA+MDiv program must complete the standard Leavell College application and then submit the BA+MDiv Interest Form. The director of the Accelerated BA+MDiv program will receive the interest form and evaluation candidates. Acceptance into the Accelerated BA+MDiv program is contingent on acceptance to Leavell College and approval by the director of the Accelerated BA+MDiv program.